Association football is a sport, played between two teams. There were various attempts to codify the rules of football in England in the mid-19th century. The present laws date back to 1863 where a ruleset was adopted by the newly formed Football Association. In its country of origin, United Kingdom, it is called football. In other countries, such as the United States and Canada, it is called soccer. In Australia, New Zealand, Ireland, South Africa, and Japan, both words are often used. Each team has 11 players on the field. One of these players is the goalkeeper, and the other ten are known as "outfield players". The game is played by kicking a ball into the opponent's goal. A match has 90 minutes of play, with a break of 15 minutes in the middle. The 90 minutes of play also includes injury time. The break in the middle is called half-time. There are many competitions for football, for both football clubs and countries. Football clubs usually play other teams in their own country, with a few exceptions. Cardiff City F.C. and Swansea City F.C from Wales for example, play in the English leagues and in the English FA Cup. Groups such as UEFA and FIFA organise international competitions between clubs and countries. 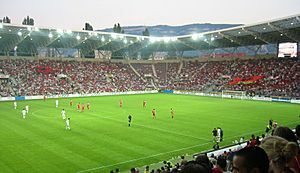 Clubs play in competitions such as UEFA Champions League or UEFA Europa League, and countries play for the World Cup or a continental trophy such as the UEFA European Football Championship. The FIFA World Cup takes place every four years between national teams, and is the world's most popular sporting event, even more popular than the Olympic Games. In football, there are two main types of competitions. In a "league", all of the teams play the same number of games, but in a "cup", teams leave the competition when they lose, until the last two teams play each other to decide the winner. Football is the world's most popular sport. It is played in more countries than any other game. In fact, FIFA (the Federation Internationale de Football Association) has more members than the United Nations. It is played by both males and females. In Europe, the main competitions to compete to be the best in Europe are the Champions League for the top teams from the top leagues in each country in Europe. Then there is UEFA Europa League which is for the next best teams from each member of the UEFA. The most successful club in the world, in terms of domestic league results, is Rangers F.C. from Scotland, who have won more domestic league titles than any other team in the world. They have won the country's league 51 times which is a world record. Other successful clubs are FC Barcelona and Real Madrid from Spain, or Manchester United from England. The side which scores the most goals wins. If scores are equal, the result is a draw. The officials in a football game are a referee and two linesmen. Goals are scored by getting the ball into the opponents' goal, more than halfway across the line. Referees have access to goal-line cameras to decide close cases. The offside rule means that there have to be at least two defenders between the attacker and the defenders' goal when the attacker's teammate passes the ball to him/her. (This is not a complete summary: the rule is complex). Usually, one of the two defenders is the goalkeeper. 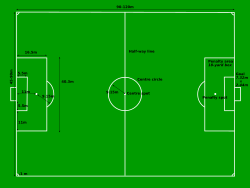 Players may not use their hands or arms (handball), except the goalkeeper, who may use them within his own penalty area (penalty areas are in front of both goals). The ball is out of play if it crosses the field boundaries. If a player kicks the ball out of play at the side of the field, the other team gets to throw the ball back into play (a throw in). If a player kicks the ball out of play at the other end of the field, the other team kicks the ball back into play from directly in front of the goal (a goal kick). Football is a game of two halves. Each half is 45 minutes. The referee may add time to the end of each half when play is delayed due to injuries or substitutions. There is an interval of ten minutes between halves. Each team is allowed up to three substitutes from the bench during the course of a game. No player substituted can return during the game. Players may not trip or push each other (a foul). Players may not hold each other or stop other players from getting to the ball (obstruction). When a player scores he is not allowed to jump into the crowd. If he does he will get a yellow card. The same applies to lifting their shirt in celebration. Players must not abuse referees in any way (verbally or physically). Players who commit bad fouls get shown a yellow card. Players who commit really bad fouls, or get shown two yellow cards in the same game, get shown a red card. Players who get shown a red card get sent off the field and cannot finish playing the game. In some competitions (like the Premier League in England) you miss the next game (suspended) if you get a red card, or pick up 5 yellow cards during the season. 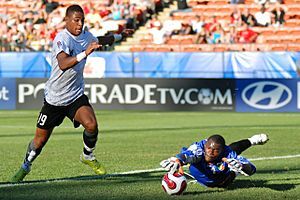 Women's football final at 2007 Pan Am games. Association football Facts for Kids. Kiddle Encyclopedia.